Lee, J., Eom, J., Jeong, S., Hong, S., Park, E., and Lee, J. (2017). Influence of carbonized crop residue on soil carbon storage in red pepper field. Journal of Ecology and Environment 41: 40. DOI: https://jecoenv.biomedcentral.com/articles/10.1186/s41610-017-0059-7. Carbon dioxide (CO2) is a well-known greenhouse gas that poses a threat to our environment. However, this gaseous form of carbon is not the only contributing factor to global climate change. Carbon is moved and transformed through the atmosphere, vegetation, and soil via the carbon cycle. The balance between absorption of CO2 from and release of CO2 into the atmosphere determines the size of the net carbon pool in the soil environment. When carbon is stored in the soil, it takes the form of soil organic matter (SOM). Crop residues are a major source of soil organic matter in agricultural environments. Crop residues have very high carbon contents, which allows them to be broken down quickly. This rampant decomposition results in the return of large amounts of CO2 to the atmosphere via soil respiration, which ultimately limits the amount of carbon that is typically retained by farmlands. Sequestering carbon in the soil environment is an important step reducing the amount of CO2 emitted into the atmosphere and, in turn, mitigating the effects of global climate change. In order to improve the amount of carbon retained by agricultural ecosystems, many studies have analyzed the effects of adding carbon amendments to farmland soils. There are many potential benefits associated with the addition of carbon sources to soil. For instance, such additions can increase the size of the soil carbon pool. They can also improve overall soil health, by reducing soil erosion and increasing soil nutrient retention. However, carbon amendments may also increase the amount of CO2 released to the atmosphere through soil respiration. Researchers in Korea recently performed a study investigating the effects of adding carbonized crop residue to red pepper (Capsicum annuum L.) fields. 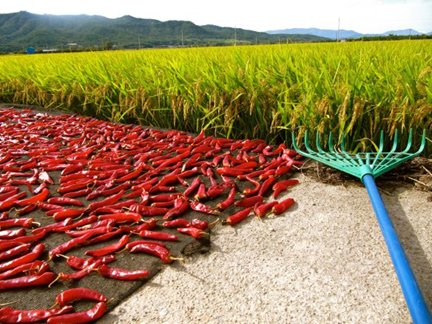 Red peppers are one of the most commonly farmed crops in Korea. Once the actual peppers are harvested each year, the pepper plant stems are typically discarded or burned, at which point the plants’ carbon is emitted as CO2 into the atmosphere rather than being stored in the soil as part of the soil carbon pool. Researchers investigated whether or not storing the crop residues and applying them to farms (rather than discarding or burning them) would allow for the conversion of farmland soils into carbon sinks (absorbing carbon) rather than carbon sources (emitting carbon). Researchers planted the peppers on farms of similar soil type and organic matter content so that they could be compared equally. Carbonized residue amendments were created by cutting the pepper plant residue into small pieces, sealed in a container, and burned. Study sites were divided into three groups; one area received the original pepper crop residue as its amendment, one area was amended with the carbonized pepper residue, and the final area served as a control area (where no carbon sources were added). Residues added were evenly mixed into the soil. In order to quantify the effects of each amendment type, researchers measured the rates of soil respiration and carbon decomposition that took place at each study site, which allowed for a comparison of soil absorption and emission of carbon. Researchers found that soils amended with the normal crop residue produced the highest amount of CO2 per hour, followed by the soils amended with carbonized crop residue, and finally the control soils (which received no amendments). Adding carbonized crop residue reduced the amount of CO2 emitted into the atmosphere, allowing more carbon to be adsorbed into the soil environment. Results from the decomposition experiment followed similar trends; decomposition of the normal crop residue occurred early and rapidly in the experiment, resulting in higher decomposition rates than those found in soils amended with carbonized crop residue. Heightened rates of organic matter decomposition corresponds with the heightened rates of soil respiration exhibited by the normal crop residue groups. This study highlights the large impact that soil additions have on overall soil emissions. Results suggest that rather than throwing crop residues away, carbonizing crop residues and adding them to farmland soils could positively influence not only the soil environment, but also the atmosphere as a whole. Amending farmland soils with carbonized crop residue promoted the absorption of carbon from the atmosphere, which may push these soils in the direction of becoming carbon sinks, and may push our society one step closer toward reducing CO2 levels in the atmosphere.